The naming of Monks Hall could go back as far as the 1200's. It is known as a Tudor residence with modern additions. 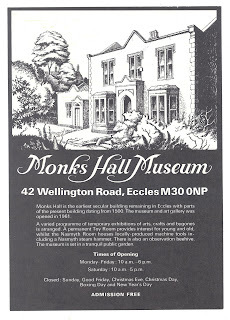 From the 1230s the monks of Whalley Abbey owned much of the land in Eccles, which could haven given the hall its name. Alternatively, in 1394 there was living in the town a Henry de Monks; it could be that his family may have given their name to the house or taken their name from it. After the Reformation in 1660 the hall became a place of worship for the Nonconformist congregation established by the Rev Edmund Jones who in 1662 was expelled from being the Vicar of Eccles and when the congregation moved out a family named Willis took up residence. In 1836 Monks Hall was a farmhouse and it was further modernised in the 19th century. When a new road was being constructed in 1864 a hoard of 6,000 medieval coins were discovered close to the boundary wall, money probably buried by the owners of Monks Hall when the country was torn with civil strife. In the latter half of the 19th century the building became a doctor's residence and for 50 years was the home of a Dr George Sidley and subsequently his son Dr I. M. Ridley. Dr Ridley was also the Doctor in charge of children at St Joseph's Home in Patricroft and often children would be invited along to the house for a look around. Eccles council purchased the house from him in 1959 after he had retired from practice, the house, land and furnishings cost £7,155. 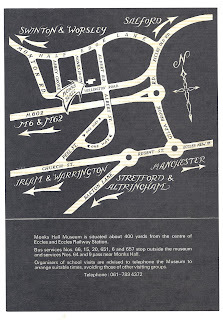 The building was opened as a museum on Thursday 6 July 1961 by Lord Derby, assisted by the Mayor of Eccles, Ald R. Benson, Cllr G. Edwards, Cllr Dow and Dr Owen, Director of the Manchester Museum. Interestingly enough the first exhibition was a collection of memorabilia loaned to Monks Hall by Manchester United, it contained such items as gold medals, trophies, team pennants, international caps and football jerseys worn by such stars as Billy Meredith and George Wall. Such was the interest in the new Monks Hall museum that it attracted a 1,000 visitors in just three days after the opening, obviously many of them had come to gaze at the Manchester United display! 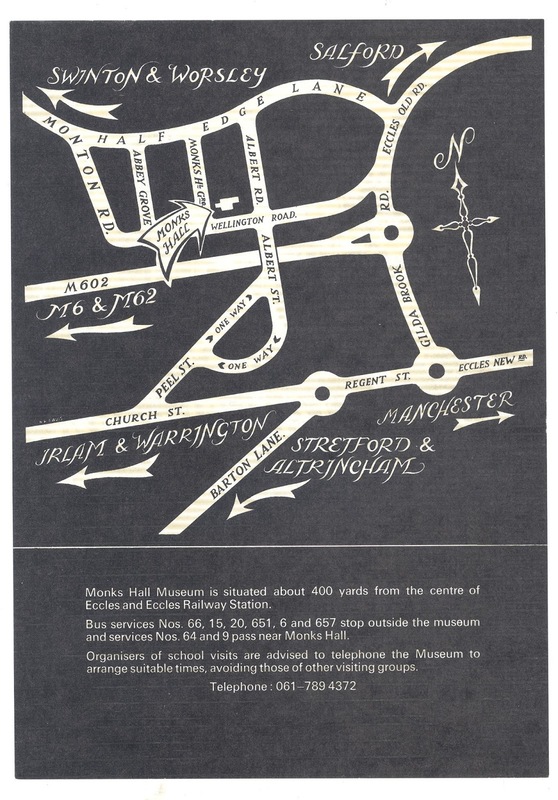 Over the years the museum held some fascinating exhibitions including artwork by LS Lowry, Harold Riley, and Geoffrey Key, also local schools and painting and photographic societies held regular exhibitions there. Sadly and for reasons unknown the museum closed its doors for the last time in the late 1980s. 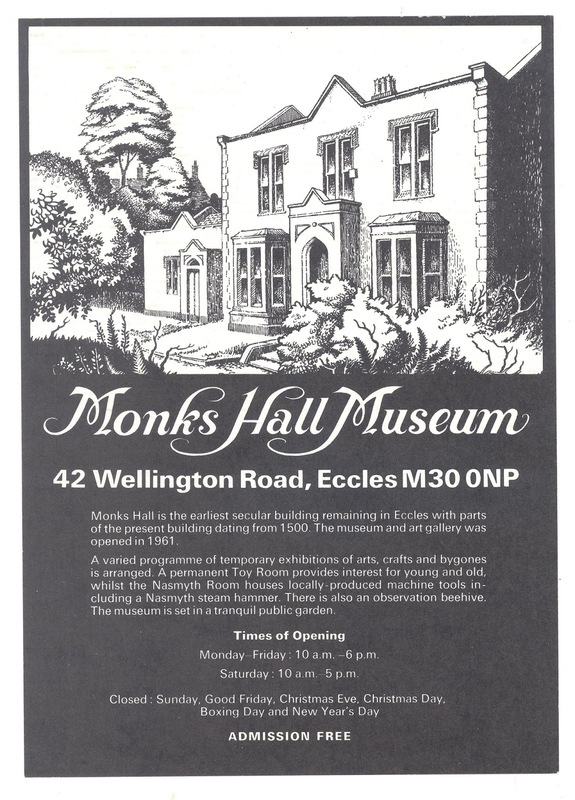 It remained empty and neglected for over a decade until a local business man, Grant Chapman purchased the museum and turned it into Monks Hall Restaurant in April 1997, this too closed in 2002. Property developer Mark Hammond then purchased the land with plans to turn the museum building into four luxury flats with a further 24 flats at the rear. No work has ever started on this development and the building looks as if it is ready to collapse following years of neglect and vandalism. So the future of Monks Hall looks bleak and I fear that once again another of our fine buildings will disappear.